The state of Alabama is an unlikely hockey hotbed and certainly not the first place many scouts think of when looking for future NHL stars. But Gordie Clark, the Rangers' Director, Player Personnel, and his team of scouts are committed to finding talent on all parts of the map, and this past season, that quest took them all the way to Huntsville, Ala., where they found a goaltender with a bright pro future. Unless you're an avid follower of the four-team College Hockey America conference or happen to live in Huntsville, you likely never heard of Cam Talbot before this season began. Clark didn't know much about him either, but a phone call from amateur scout Larry Bernard changed all of that in a hurry. Twenty years ago, Bernard, a 1985 Rangers draft pick, was an AHL teammate of fellow 1985 NHL draftee Danton Cole, who went on to play 318 games with five NHL teams before retiring a decade ago. In 2007, Cole took over the NCAA Division I program at the University of Alabama in Huntsville. Three years later, he was telling his old friend Bernard about a stellar UAH Chargers goaltender from Caledonia, Ontario. Bernard relayed Cole's information to Clark, who began sending scouts to watch the 6-foot-3, 200-pound Talbot in action. "I knew it (the NHL) was a possibility, and that scouts would come to watch down there, but it wasn't really until maybe December or January when my coach pulled me aside and told me that teams were looking at me," said Talbot. "I guess it was about in the middle of the season this year where things started to happen for me and I started to get noticed a little bit." Talbot, who turns 23 next month, used up his NCAA eligibility as a junior because he had attended a Canadian university for two years prior to playing college hockey. Clark said he believes the Rangers were likely one of very few NHL teams that knew this about him during the scouting process. Goalie Cam Talbot had a year for the record books at Alabama-Huntsville in 2009-10, setting team marks for games played, minutes played and total saves. By year's end, he became the first player in the program's history to leave with an NHL contract. 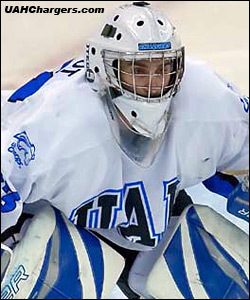 When he was first recruited by UAH, Talbot was a lesser-known but promising Tier II goaltender with the Hamilton Red Wings. Coming off an All-Star season in 2005-06, he could have played four years at any college that offered him a scholarship, but no NCAA Division I program had shown interest until UAH came calling in the summer of 2006. Figuring he might never get a Division I offer, Talbot had been working toward a finance degree at a university in Ontario. He needed to complete some classes before transferring another school, so he was forced to put UAH on hold and return to his junior team for one more year. He also had the option of going to a major-junior team at that time, but decided that wasn't the direction he wanted to take. "I went the college route because I knew a few guys that I used to play with that were drafted into the OHL. They played a couple of games and then never really made it anywhere else," said Talbot. "It completely ruined their college eligibility just for a couple games, so I kind of saw that as not being worth it. Also, my parents really pushed for school when I was younger, so that was one of the main reasons why I went to college." The 2006-07 season turned out to be a huge year for Talbot. He dominated the OPJHL as a 19-year-old, going 19-3-2 with a 2.08 goals-against average and .918 save percentage. Those achievements earned him OPJHL MVP honors as well as a second straight All-Star berth. All of a sudden, several other Division I colleges that wanted Talbot to join their hockey programs, but to his credit, he refused to turn his back on UAH and honored his promise to spend his three remaining years of NCAA eligibility to Huntsville. Located in Northern Alabama roughly two hours south of Nashville, Huntsville plays in a non-traditional hockey market, but its program is a proud one, dating back to 1979. It has been part of the NCAA Division I level since 1998 and is a founding member of College Hockey America. Two former members of the UAH program, forward Jared Ross and goaltender Scott Munroe, have recently played in the NHL with the Flyers, but both had to establish themselves in the minor leagues before gaining NHL-level deals. When Talbot signed with the Blueshirts on March 30, he became the first Chargers player to sign an NHL-level contract right out of college. The crowning achievement for Talbot came at the end of the year, when he carried UAH to victory in the CHA postseason tournament, earning the Chargers a berth in the NCAAs. As the lowest-ranked team in the field, Huntsville went up against No. 1 Miami-Ohio in the first round, and nearly pulled off an upset for the ages, falling by a slim 2-1 margin. Without Talbot, the Chargers would not have gone to the NCAA tournament, and they certainly wouldn't have limited Miami to two goals. In the two CHA tourney games, Talbot stopped 29 shots for a 1-0 shutout of Robert Morris and then made 43 saves in a 3-2 overtime win over a Niagara team that outshot the Chargers 45-24. "I told our scout I expected them to get spanked in the game, but they won," said Clark. "They won it and got to go to the NCAA tournament, so I sent another couple guys in to watch him. They got beat in that second game, but in both games, they were in it." 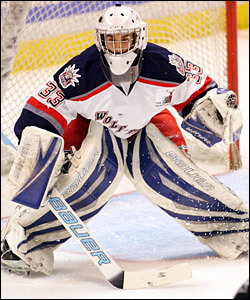 His 2009-10 stay with the Hartford Wolf Pack after signing with the Rangers in late March was brief, but Cam Talbot did get a chance to sample the pro hockey lifestyle and played in one home game. Against Miami at the NCAA Midwest Regionals at Fort Wayne, Ind., Talbot stopped 36 shots in defeat. That included 12 saves in the third period of a game in which the Chargers were outshot 38-17. Such gems were typical of Talbot's season. He made at least 35 saves in 11 of his 33 games and made at least 40 in six of them. These heroics earned him a spot among the Three Star selections 10 times, and many of them came in losing efforts for a Chargers team that finished third out of four teams in College Hockey America, avoiding last place only on the strength of a tie-breaker vs. Niagara. Although most of Talbot's competition came within CHA, the Chargers did play several major college programs, including two games at Notre Dame to open the season. Talbot got his season off to a big start in those matchups, stopping 39 of 41 shots in a 3-2 upset win on Oct. 9 and coming up with a season-high 48 saves in a 3-1 loss the following evening when the Irish outshot the Chargers 51-14. A similar script unfolded in a holiday tournament game at the University of Vermont on Jan. 2 -- a 4-3 loss that saw Talbot stop 35 shots against a Catamounts team that outshot the Chargers 39-14 -- and in a Jan. 9 game at Clarkson -- a 44-save effort for Talbot in a 3-3 tie where his team was outshot 47-21. Talbot said games against bigger-name opponents really stood out for him. "There were definitely a lot more shots and a little better caliber of shots, I would say, playing against Miami-Ohio in the tournament. Those guys had a lot of big boys that could shoot the puck," said Talbot. "It was the same with Notre Dame at the beginning of the year. We got outshot quite a bit this year, but we always found a way to squeak through and pull out some big wins against some of those teams." Being outshot never bothered Talbot, who enjoys heavy-workload games. "I definitely thrive on that," he said. "I'd rather have 40 shots, which keeps me in the game, as opposed to 20 shots, where you're just trying to stay focused and kind of getting cold every once in a while if you're not getting a shot at least every five minutes. I seem to have better numbers when I have those games. I seem to be a little more focused, I guess you could say, because you're always in the play." Talbot is particularly excited to be joining the Rangers because he'll have a chance to work with Goaltending Coach Benoit Allaire, who has a reputation for bringing out the best in young netminders. "I knew (the Rangers) had a good goalie coach and I had heard that he is one of the best in developing players," said Talbot. "So I'm looking forward to the mentoring from a very experienced goalie coach. Obviously, he's done well with a lot of goalies and moved them up. So I knew that would be a good place to try and develop myself and hone my skills." 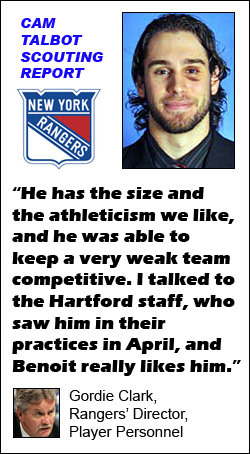 After signing with the Rangers, Talbot got his first sense of the pro lifestyle during a brief stint at Hartford. He spent the season's final 10 days with the AHL's Wolf Pack and played the last 18:33 of a March 30 game against Worcester, stopping eight of 11 shots. Helping a college goaltender adjust to the next level involves few basic adjustments, according to Allaire. "I think it's just the approach to the game that you focus on," said Allaire. "The way the speed differs and what it takes to have a positive result day after day. It's a tough schedule, and for a player in Hartford it's even tougher, because in the AHL, you sometimes have four games in five nights." Perhaps the most impressive part of his quiet but determined march to pro hockey is that Talbot managed to make a name for himself despite playing on relatively weak college teams. Over the course of his three years at UAH, his won-loss record was 15-44-6, but the last of the losses came against the No. 1 team in the nation -- a game the Chargers never would have played in had it not been for Talbot. "His coach told us that his team wasn't very good last season, but the reason they were even in games was because of this kid," said Clark. That's the sort of talk Talbot is happy to hear, because keeping a team in the game is one of the reasons he lists Patrick Roy as his all-time favorite goalie -- and the one he would love to emulate as a pro. "Roy was the goalie that I admired growing up, because he could always win the big games and no matter how much they were outshot or outplayed, he always found a way to win it," said Talbot. "I think that's what I like to model my game after and how I kind of want to be viewed as a goaltender -- just as a guy that's always ready to compete and always focused and always helping his team win."